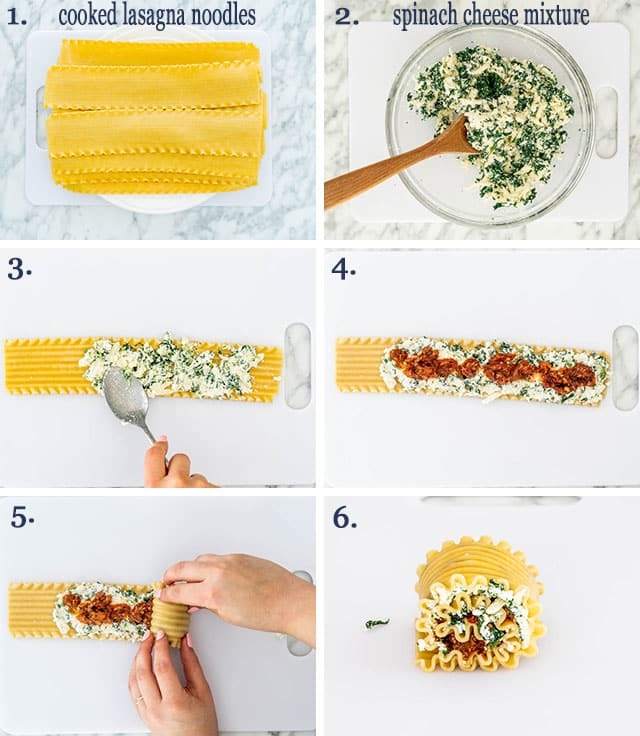 Incredibly delicious Lasagna Roll-Ups that are totally delicious and a true comforting dish presented in a fun new way. Take the guesswork out of portion control. 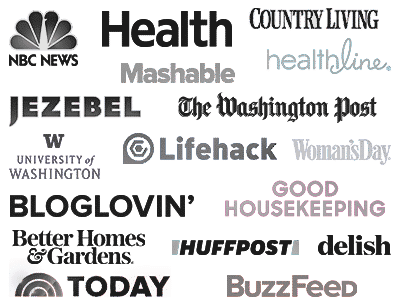 I’m sure everyone has their favorite lasagna recipe, but this is my easy recipe that I use whenever I am in the mood for lasagna. So whether you make it as a regular lasagna, or lasagna roll ups, this recipe is very easy to make. Why? Because the ingredients are simple ingredients you already have in your pantry or fridge. 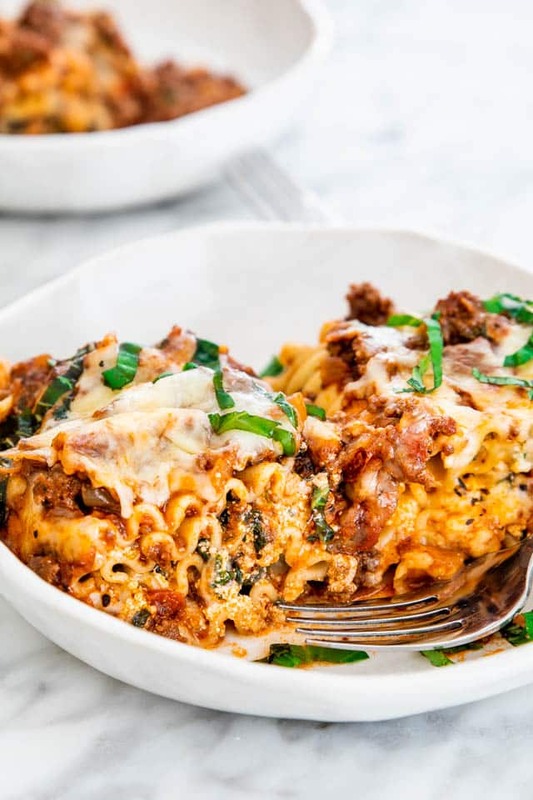 These individual lasagnas are filled with a spinach cheese mixture and a delicious homemade meat sauce that are family-friendly and perfect for portion control. Take the guesswork out of portion control. This is a recipe I shared with you back in 2012 but I redid it with better pictures, I created a video for it and gave you more information to help you. While you can definitely buy a store bought pasta sauce such as a marinara sauce, the best sauce is always a homemade sauce. The sauce I made here is a meat sauce with ground beef. While it’s relatively easy to make, these sauces taste better the longer you simmer them. You’ll notice I used both a big can of diced tomatoes and a small can of tomato sauce. You could also use a can of crushed tomatoes too and if you want more of a concentrated tomato flavor, throw in some tomato paste. Don’t skimp on the onion, garlic and herbs. This is how we build flavor in the sauce. You can also use fresh herbs instead of dried herbs. For the spinach cheese mixture that’s used as the filling, ricotta cheese is a must. I also love to add some mozzarella to it as well. Again, don’t skimp on the cheese. After all, lasagna is about the cheese. At least in my humble opinion. To top over the casserole, I used more mozzarella cheese. If you want you can add some freshly grated Parmesan cheese as well! There are basically 4 main steps to making these lasagna roll-ups. Make the sauce, the filling, assemble, and bake. Make the sauce: The secret to making a great sauce besides using great ingredients is simmering it for a long time. In the recipe I mention to simmer it for 30 minutes. 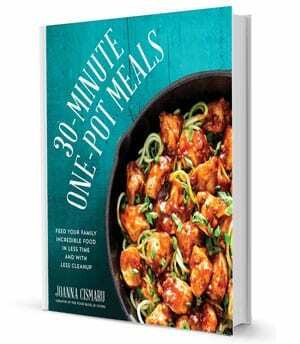 However, if you’ve got more time, go ahead and simmer it for 1 or 2 hours, you won’t regret it. Also don’t be afraid to add more herbs for greater flavors, such as fennel seeds. Make the filling: The filling is the easiest part of this recipe. Simply combine the spinach with the ricotta and the mozzarella cheese and you’re good to go. Assemble: Assemble the roll-ups as stated in the recipe. 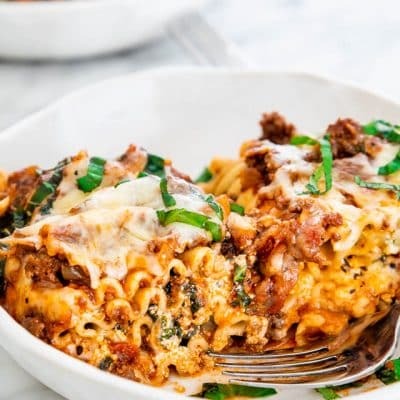 I decided to use a little bit of the meat sauce in the roll-ups as well, to get some of that delicious meat sauce all throughout the casserole, but it’s totally up to you. Bake: Cover the lasagna dish with aluminum foil and bake covered for 30 minutes at 375 F degrees. Remove the foil and bake for another 10 minutes. 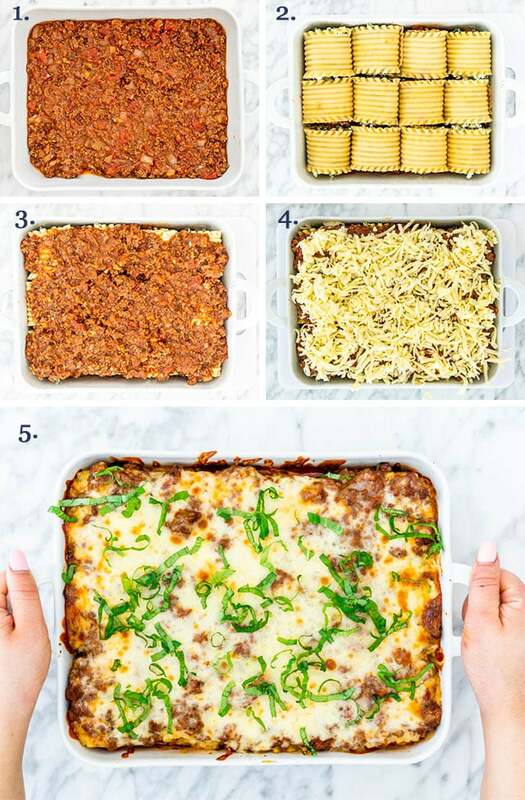 How Do You Store Leftover Lasagna? Cool the lasagna first, then cover the casserole dish with aluminum foil or if it’s cooled completely you can use plastic wrap and store it in the refrigerator for 3 to 5 days. How Do You Freeze Lasagna Roll-ups? Lasagna is freezer friendly and great for make ahead. You can freeze them individually or the whole dish. Individually frozen: Follow the assembly directions but instead of placing them in the casserole dish, place them on a cookie sheet, then flash freeze them for about 1 hour. Take them out of the freezer and take each roll and gently place them in a freezer bag, then freeze. Freeze the meat sauce separately in an airtight container or freezer bag. To serve: Heat up the frozen meat sauce in the microwave for a few minutes until it’s no longer frozen. Spread a couple ladles of the sauce over the bottom of a baking dish. Place frozen lasagna rolls in the dish, then ladle the remaining sauce over the rolls. Sprinkle mozzarella cheese over the sauce, then follow baking instructions, as noted in the recipe. Casserole-style freezing: Follow the instructions completely as noted in the recipe, but do not preheat the oven. Cover tightly with aluminum foil. You can also use disposable aluminum pans with lids. Label the lasagna and include the date on which it was assembled. Freeze for up to 3 months. To serve: Defrost the lasagna in the refrigerator overnight. Bake as instructed in the recipe. If the lasagna still feels a bit frozen when you take it out of the fridge, you may need to add 10-15 minutes to the baking time. Cook noodles: Cook lasagna noodles according to package instructions. Drain and set aside. Make sauce: In a large sauce pan, heat olive oil over medium heat. Add the ground beef and using a spoon, break the meat into small pieces. Cook until the beef is no longer pink, should take about 5 minutes. Add the onion, garlic, oregano, basil, salt and pepper and cook another 5 minutes until the onion is translucent. Add diced tomatoes, tomato sauce and stir. Bring to a boil then lower heat and simmer for 30 minutes, stirring occasionally. Prepare spinach/cheese filling: In a medium sized bowl add the spinach, ricotta cheese, mozzarella cheese and stir to combine. Set aside. Prepare oven: Preheat oven to 375 F degrees. Assemble lasagna roll-ups: Spread a couple ladles of the sauce over the bottom of a baking dish. Lay out lasagna noodles, make sure they are dry. Spread about 2 to 3 tbsp of the spinach/cheese mixture and 1 or 2 tbsp of the meat mixture over each lasagna noodle, and roll it up. Make sure you divide the spinach/cheese mixture evenly over the 12 noodles. Place each roll seam side down over the sauce. Repeat with remaining noodles. Ladle remaining sauce over the lasagna rolls, then sprinkle with the 2 cups of mozzarella cheese. Bake: Cover the lasagna dish with aluminum foil and bake covered for 30 minutes. Remove the foil and bake for another 10 minutes. Top with fresh basil or parsley if preferred, then serve while warm. Leftovers: Cool the lasagna first, then cover the casserole dish with aluminum foil or if it’s cooled completely you can use plastic wrap and store it in the refrigerator for 3 to 5 days. I just have a question. Could you make with sausage? Has anyone tried it. You can absolutely use sausage! I made this recipe exactly as is and I gotta tell ya, it’s a winner! It was a big hit in our family. Thanks for the excellent recipe! I think next time I would probably use more of a Bolognese sauce and blend the canned tom’s before adding them in because it was a bit chunky but other than that we loved it! I made this for my best friend and my family too. It was a great hit! 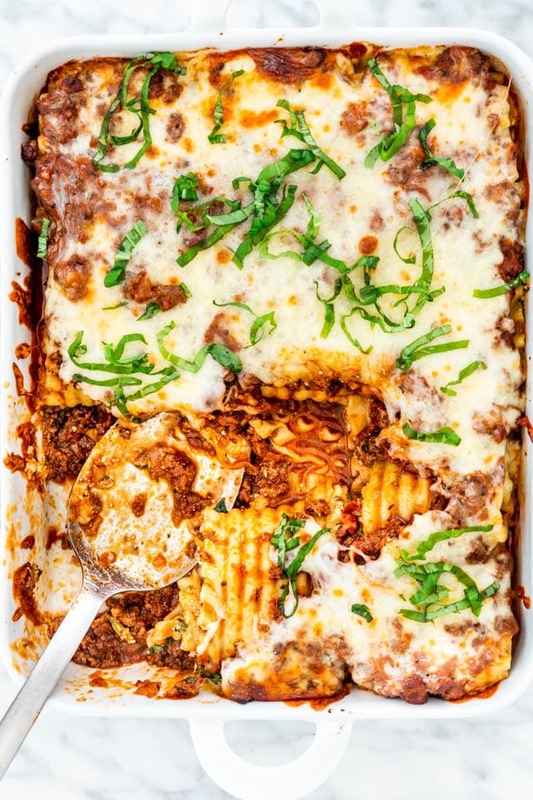 So much lighter tasting than the traditional lasagna!! You can bet this version will be our traditional version from now on!! Salwa’s friend will come for dinner tonight, Miss Jo, so here I am busy browsing your fabulous website, I think I will make antojitos and this lasagna tonight plus your chocolate magic cake. Now, I saved a lot of time, I cam still listen to music and make my exercise, thanks to you!